Pictured Maxwell put together another highly competitive outing during the third event of the season. Maxwell put together another highly competitive outing during the third event of the season. 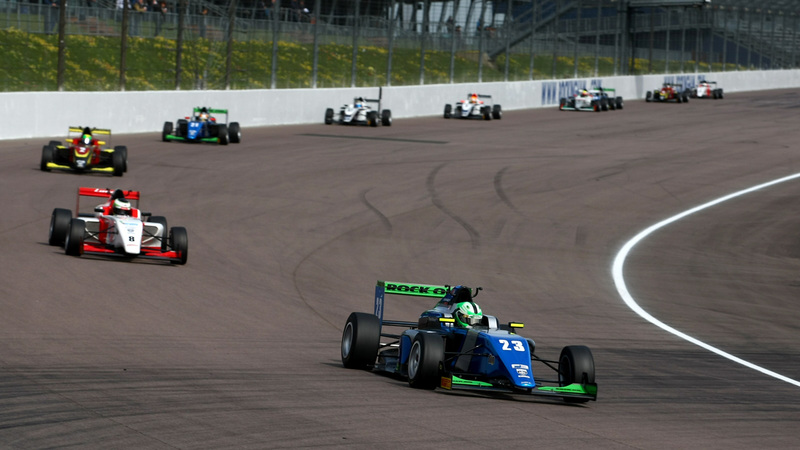 First year BRDC British Formula 3 Championship racer Thomas Maxwell put together another highly competitive outing during the third event of the season at Rockingham over the weekend, a trio of ninth position finishes consolidating the SWR driver’s strong top eight ranking in the title race. 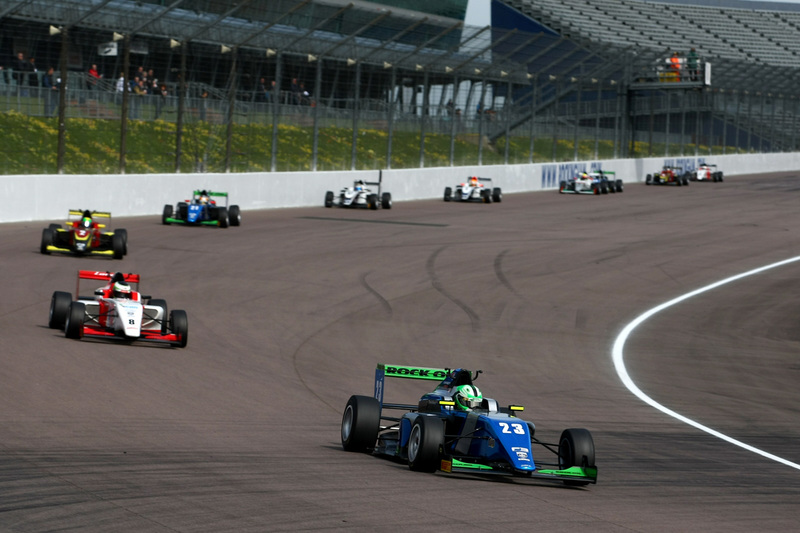 As the Chipping Norton team’s highest placed competitor in all three races at the Northamptonshire venue, Maxwell performed well in rounds seven, eight and nine to lead the squad’s charge. Danish team-mate Jan Jonck secured a best finish of 10th position in round eight on Sunday, 1st May, while Eugene Denyssen also took his highest finish of 15th place in the middle contest. Jonck was the quickest of the SWR competitors in an unbelievably tight qualifying session on Saturday, securing 10th on the grid for race one with his penultimate lap of the session. Following a red flag stoppage halfway through, the grid-determining run was re-started over a final 10-minute blast with Jonck little more than a tenth of a second shy of the top eight. Only 0.7 seconds covered eighth place to 17th in the final classification, such was the closeness of the session, with Maxwell ending the run in 12th position on the timesheets and Denyssen only 0.1 seconds shy of his team-mate in 14th place. In race one Maxwell enjoyed an excellent opening lap to climb into the top 10, at the expense of Jonck who was edged back to 11th place, and the Australian then moved into ninth on the second tour where he then stayed for the remainder of the 14 lapper to again chalk-up some healthy points. After losing a spot on lap one, Jonck consolidated his position on the fringe of the top 10 but on lap 10 he was edged back to 12th place and then 13th as a result of being caught-out by a tangle ahead involving a couple of rivals, which he fortunately avoided. Denyssen dropped back to 17th spot on the opening tour but moved back up a place on the subsequent lap. Down to 17th once again a couple of laps later, the South African ended the race just 0.5 seconds shy of 16th position. Lining-up in their race one finishing spots for the second contest of the weekend on Sunday morning, the SWR drivers all made good starts but the action was red flagged midway through lap one when Enzo Bortoleto’s car was pitched into a worrying cartwheel at Chapman Curve. At the re-start, and with Bortoleto happily unharmed, Maxwell progressed into eighth place on the opening lap while Jonck moved up into 11th and Denyssen also gained a position to move into 16th spot. While Maxwell continued to run well inside the top eight, Jonck began to pressurise Quinlan Lall as the Dane strived to break into the coveted top 10. On lap three, the SWR racer made the pass successfully and although Lall mounted a bid to try and ruffle his feathers during the latter stages, Jonck kept his rival at bay with a strong performance to secure a well-deserved result. Maxwell held eighth until the end of lap four when he was passed into Brook Chicane but, thereafter, he was unchallenged and maintained ninth place to the flag on lap 13 with pace just 0.1 seconds shy of top four performance. Denyssen leapt into 14th place from 16th position on lap two, as the tight midfield battled closely, but on lap six was edged back to 15th spot where he remained. For the weekend finale, round nine, Maxwell started on row five, with Denyssen 15th and Jonck down in 19th position. While Maxwell and Jonck each made good progress on lap one, it wasn’t as fruitful for Denyssen who was pitched into retirement at Yentwood after a tangle in the pack. Jonck made a storming start to the race to rocket into 13th position, gaining half a dozen places, but he was ultimately edged back to 14th position late on. Maxwell held ninth place throughout, seeing off the threat from behind during a tight battle over the concluding laps. Oulton Park in Cheshire will host the next three rounds of BRDC British Formula 3 action over Spring Bank Holiday weekend, 28th/29th/30th May.